Whatever happened to the “Hammersmith Residents Working Party”? 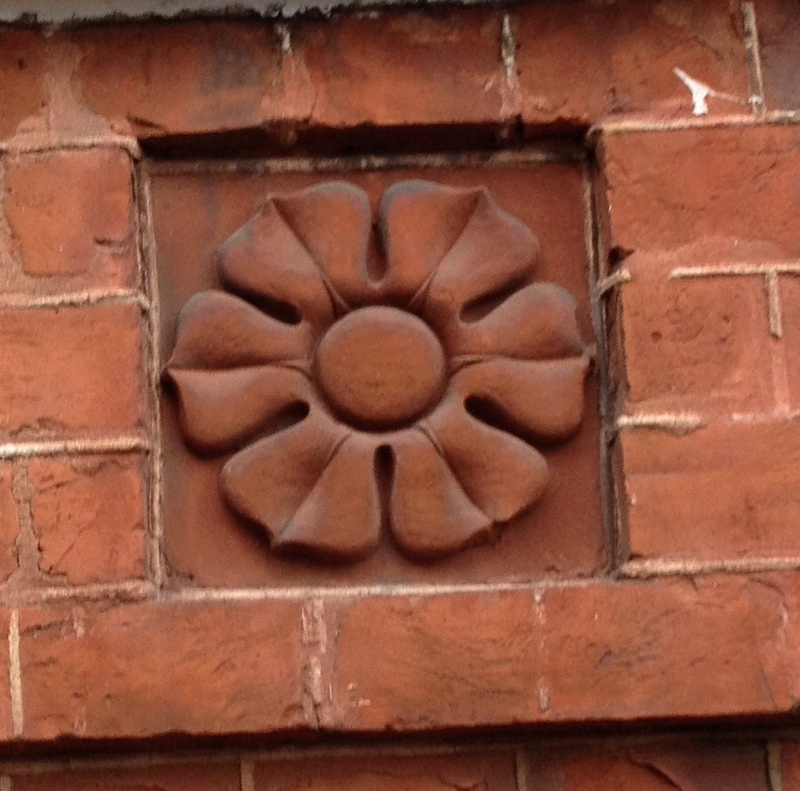 When the Council established the Hammersmith Residents’ Working Party it emphasised its importance saying that it “will in large part govern what developers are permitted to do”. But it would be closer to mark to say it meets annually – while the Council pushes through ugly, unpopular developments. “The residents working party is still in operation and we will be scheduling new workshops with the group to review the first draft of the Grimshaw masterplan in due course. The masterplan will form an important component of the future Hammersmith Supplementary Planning Document (SPD). The contribution of the HRWP will be critical to this task. “Since the last meeting (end of April) the views of the HRWP have been integrated into developing the masterplan. Grimshaw are a firm of modernist architects. We have yet to see what they are threatening for Hammersmith – but judging but the other “Master Planning” they have produced on their website it is likely to be pretty awful. So when the Council says “the views of the HRWP have been integrated into developing the masterplan” – what it means is that the Council’s policy is to have more tower blocks whether the HRWP wants it or not. Does the HRWP feel that its views are being “integrated into developing the masterplan”? Since its members are sworn to secrecy and its deliberations are not published we will never know officially. But with it not meeting at all there can scarcely be much confidence – for them or the rest of us. Even if the reality is that the Council ignores its deliberations the process is pretty chaotic and discourteous. Members who agreed to give up their time being told they would have monthly meetings on a body with genuine clout are left wondering what is happening. In November a letter was delivered to residents on the Gibbs Green and West Kensington estates from the council leader Cllr Stephen Cowan. It wasn’t from the Labour Party but was an official Council communication – and therefore subject to the rules from the Local Government Publicity Code for accuracy and impartiality. It concerned the Capco proposals for the Earls Court redevelopment. “My colleagues and I have been negotiating hard to either get the estates back or radically improve the deal and secure new like-for-like homes for all our residents on the two estates. “Capco’s latest proposal is to develop a new Masterplan for the Earls Court scheme. If that gets planning permission we would see the two estates return to council control. This could be good news. For example I have written about a popular and beautiful alternative to Capco’s plans for Empress Place. On the other hand simply maintaining the (ugly) status quo on the estates would be a missed opportunity – just as the current (ugly) Capco plans are. Would “council control” mean leaving the buildings as they are? The letter is unclear. Naturally opinions will differ whatever emerges. Which is fine – but I wish it could be more friendly, open and honest. For years there have been bitter divisions and political exploitation. Secrecy has allowed scaremongering to flourish. Once Cllr Cowan and Capco have concluded “finalising the agreement” will residents (tenants and leaseholders) be given a veto? Would such a ballot be a three way choice between the estates staying as they are, the current Capco proposal or whatever revised proposal emerges? The letter doesn’t say. Yet if Cllr Cowan thinks he’s come up with something that “radically improves” the deal then why would be be afraid of checking if the residents agree? If we try to find out more the Capco website says nothing about any changes. The TRAs – who are led by staunch opponents of the current Capco plans – are very pleased by the prospect of change. But they don’t seem to have much detail either. Those words have been removed. Instead it just says: “Meetings between developers and councillors”. Nothing is included about Capco. 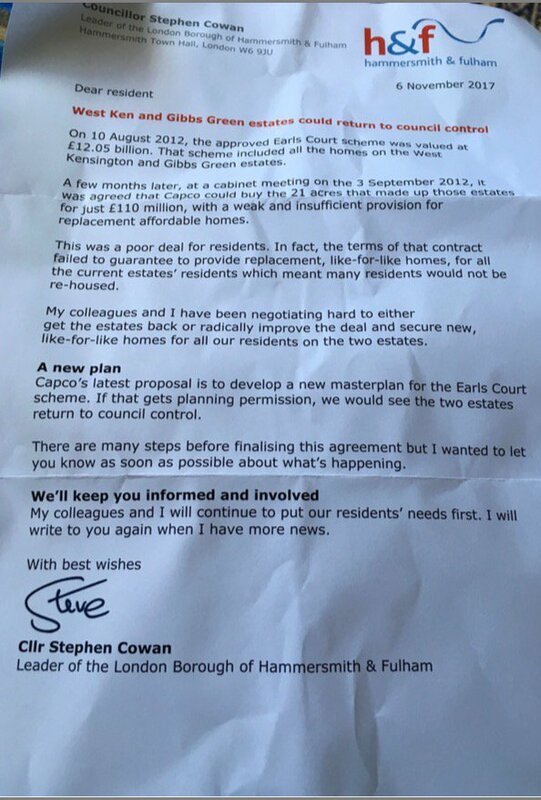 So Cllr Cowan’s letter was false when he told residents: “I have been negotiating hard.” He hasn’t been negotiating hard or soft – he’s just been “kept informed” of how others have been getting on with the negotiating. The previous claim on the Council’s website – “We now publish notes of all our meetings with developers – no secret discussions!” – was still pretty misleading even if it was the officials doing the negotiating rather than the councillors. So it was right that the Council removed those words given they did not reflect the reality. But it wouldn’t it be better still for Capco and the Council to be open about what they are planning? Wouldn’t there be a better chance of a deal being popular – and therefore sustainable – if all residents have the chance to comment at an early stage? I was pleased that last night Hammersmith and Fulham Council’s Planning and Development Control Committee rejected a proposal for an ugly office block in Wellesley Avenue. The overbearing development would also have been harmful to residents in Dorville Crescent and have had a negative impact on the character of the conservation area. Planning officers had recommended rejection and my only criticism was that they should have been more emphatic in doing so. We can all sneer at “mock Tudor”. The building is rather idiosyncratic in the context of the local area. But the point is that the proposed replacement would be awful. So that would be a bad swap. Give me mock Tudor! The office would have 200 people and so there would be a lot more traffic – with all the couriers, Uber taxis, Amazon deliveries, etc. That would be bad for local schools – with air pollution and congestion during the school run for those children dropped off. The traffic caused by the existing workshop is very modest – they take in perhaps three cars a week. Also cars are currently parked in the garage, but in future all cars would be on the street. By all means let’s have a change of use for the workshop – but it should be for new (but traditional) housing. That is what is needed rather than more offices. New developments don’t have to be unattractive. But all too often they are. Local residents and I left the meeting last night to allow the Committee to proceed with its work – remorselessly approving schemes to make our borough less and less beautiful. After the fiasco of the demolition of the cinema a public consultation opens on Thursday (9 November 2017) on the Council’s new proposals to redevelop Hammersmith Town Hall and immediately-surrounding area of King Street. Both events will be held at Hammersmith Town Hall in King Street. I have asked what alternative design (if any) will be offered to residents to the one to be produced by Rogers Stirk Harbour and Partners…. The panels with the awful new proposals are here. The Council are remaining pretty secretive regarding fiasco of the Town Hall redevelopment scheme – which was abandoned after the cinema (a “building of merit”) had been demolished. The financial viability of the scheme had been brought into question after the Council demanded extra Section 106 money from their development partners on the scheme Helical Bar. Now with the project abandoned the Council won’t get any Section 106 money, will probably be obliged to spend millions buying the land where the cinema and face delays during which the huge maintenance bill for the Council’s awful town hall extension will continue. What an almighty stuff up. Anyway apparently new plans are under way. I’m told that the under the proposed new scheme will include a replacement cinema (provided by Curzon) also that the town hall extension will go. The architects involved are Richard Rogers so whatever is built will be pretty hideous – but could scarcely manage to be worse than what is there at present. There is a plan for 210 flats of which half will be “affordable” (whatever that turns out to mean). The housing association that it is proposed will be involved is A2Dominion. I have some concerns about them as a landlord. Only yesterday I was talking to residents in Invermead Close (which they own) and came away with a litany of complaints about delays with repairs, failure to deal with rats, poor parking arrangements and so on. The grandly named “Town Hall Development Commission” is supposed to be “resident-led”. This is a bit of a joke. It has four people on it – the council leader Cllr Stephen Cowan, a couple of architects and Melanie Whitlock. I think Melanie is a capable, independent minded and public spirited figure. But she is just one resident – and she is the first to say that she does not pretend to represent anyone other than herself. There is due to be an exhibition of the new plans in November.